Today commemorates the day Jerusalem was reunified in 1967. It’s a wonderful day of pilgrimage to the Old City and Western Wall, of Jews and people from all over Israel and the world. For me it’s a day of gratitude for living in Jerusalem. For being able to march through Mamilla and through Jaffa gate, power walking into the Jewish quarter to join the Mizrachi walking group tour, with confidence and a sense of I live in this city. It feels wonderful not to be a stranger. To know exactly where to get the best coffee in a one kilometer circumference of where ever I am. But Jerusalem’s not only my home, it’s home to every Jewish, Christian and Muslim pilgrim that gather from far and wide. For some reason Jerusalem is a magnet that attracts people, as it attracted me, and despite the excellent coffee, the captivation defies rational. Yes Jerusalem is a beautiful city, of weathered old stones, which have been recycled from century to century as each capturing army reuse and recreate the city of David and Solomon. But it’s also expensive, hence people joke, that’s why it’s called the city of Gold. It’s a city of extremes, of very poor Haredim and Arabs, and the very rich Chutznikim, who’ve raised the house prices so that real estate here is also at a gold premium. It’s a city littered with refuse that make the German tourists gawk, and a city where every one is trying to get the best deal, and not be made a fool of (like the rest of Israel). It’s a city where shopping for food is a journey, especially if one chooses to go to Machane Yehuda (which isn’t much cheaper than the local supermarket by the way), where wages are lower than Tel Aviv, and parking requires a science degree. Yet everyone I speak to who lives here (unless they’re cynical Olim) love it here. They wouldn’t live anywhere else. Not if you paid them. And when you ask why? They say because it’s Yerushalayim. It’s the dream of one taxi driver’s grandmother from Kurdistan, who walked here on foot in the early fifties. You don’t throw away dreams. The question I’m left with as I’m privileged to live in the city of dreams, is what is the next stage of the dream? The answer is obvious as I walked through the Old City, through the Jewish, Muslim and Christian quarters. Where everyone was at peace, or as peaceful as the narrow streets of bazaars can be, more concerned with selling their colorful Armenian ceramics, fragrant spices and religious icons, than politics. It genuinely felt like the whole city was celebrating reunification. Which may sound naive (especially as security was high). But dreams are built on naiveté. Cynicism didn’t reunite Jerusalem. And the real dream is the world dream of peace in our times, in our streets, in our city, between different faiths, cultures and people. And the city that it is literally happening in is this city. Jerusalem is truly the City of Peace, in opposition to many people’s projected perceptions of discontent and strife (which of course it can also be). 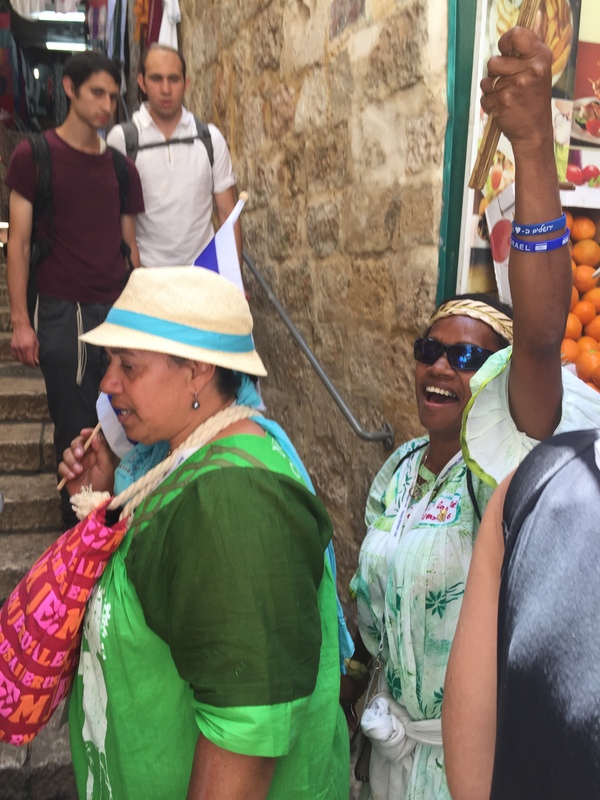 Jerusalem Day is Remembrance Day for Ethiopians – Marching through the Old City to the Western Wall. Who said you can’t light a bonfire wherever you want?